And a shout out must be given to Stanley Bill. The Polish language one of the trickier to render into English, not to mention that Dukaj sometimes writes in experimental style, the work could not have been easy to translate. 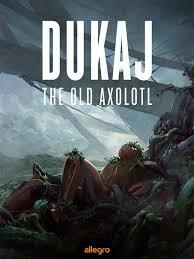 And when I compare Bill’s translation to that done for Andrzej Sapkowski’s The Last Wish, there is a notable difference in quality, something which makes The Old Axolotl not only more enjoyable in terms of lingual sophistication, but enables better comparison to works written by native writers. In the end, The Old Axolotl is one of the most unique reading experiences, from interpreting animal shapes on cave walls to digitially publishing novels, the world of fiction has produced. With its post-ap, mind-uploading-to-robots ideas, the story itself is perhaps not the wildest idea ever to surface. But given the meta-narrative, the graphic designs, that Dukaj interrogates his ideas rather than uses them as mere entertainment, and that the novel could only have been published as an ebook make for a forward thinking experience. Mythopoeic science fiction written in a dynamic style like Stross but with a deeper, guiding intelligence like that of Stanislaw Lem, it’s a book to look out for—on the internet only, as paper copies cannot exist.